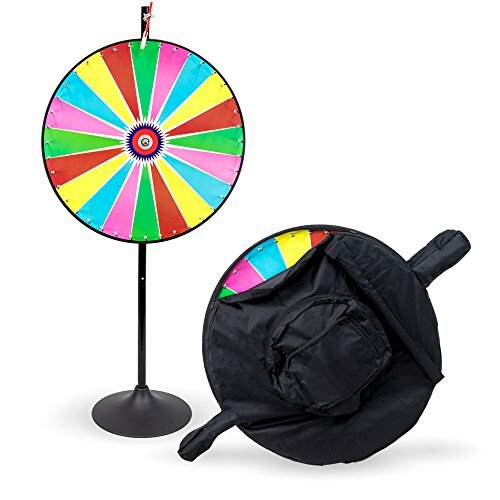 Whether you have an important business tradeshow to attend or need something new and exciting for a fundraiser or annual meeting, our 36 inch, Dry Erase Color Prize Wheel with Extension Base is the perfect solution. A colorful, dry erase surface covers the front of each wheel. There are a total of 20 sections available for customization. Any standard dry erase marker will write on our prize wheel. It is easy to erase with a dry eraser or dry or damp cloth. Set your prizes easily by hand. Our wheels are made from the highest quality, cabinet-grade MDF wood. Each wheel is hand balanced to ensure a random spin. The wheel spins on maintenance-free, aircraft-quality bearings and features durable black-edge molding, heavy-duty ¼ inch pins with plastic end caps, insert lock nuts and a professional red urethane clapper with white Delrin tip. Each wheel measures 36 inches in diameter and comes with a powder-coated, black metal base and steel extension pole. The base height is 17 ½ inches, but when the pole is fully extended, the stand measures approximately 66 inches tall.